If you've got, I don't know, a couple months nine years to kill with nothing else to do, start following @555uhz on Twitter. That person will let you watch Top Gun for free, just as long as you don't mind watching it without sound — and about a frame at a time. @555uz has been faithfully tweeting one of Jalopnik's favorite films piece by piece since the end of January. As of this writing the movie is still at the bar scene, so there's plenty of time to catch up if you're late. God only knows how long tweeting the entire film will take. First Archer, now this. 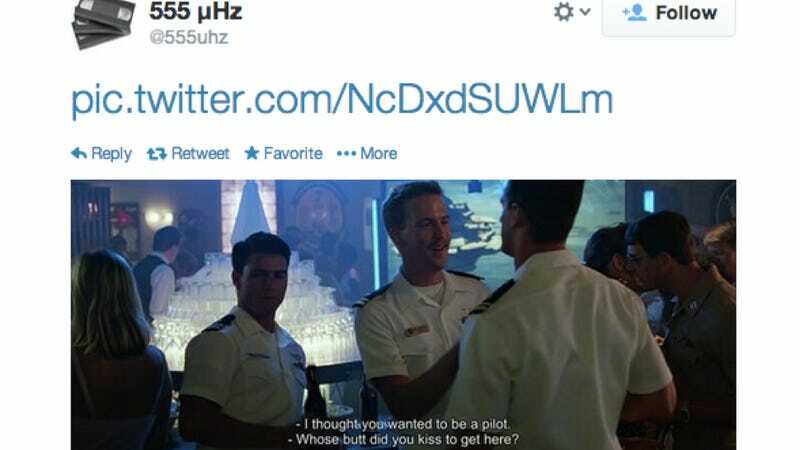 It's good to see Top Gun getting the love it so richly deserves. I think I'm gonna make several weeks worth of popcorn.